If you did this plus added a hood, this towel would be out of this world! She used strips of Stitch Witchery under the letters (she bought the Stitch Witchery at Wal-Mart), ironed the letters on, then zig-zagged the edges. 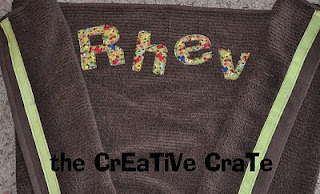 She then added strips of ribbon on both ends of towel and stitched those edges. Okay, so I haven't TOUCHED those hooded towels since that Enrichment night. Nor have I looked at the blog for the tutorial. Efficient is my middle name--can't you tell? ;) I may need you to come help me get them done.